Thanks, John. Always interesting. 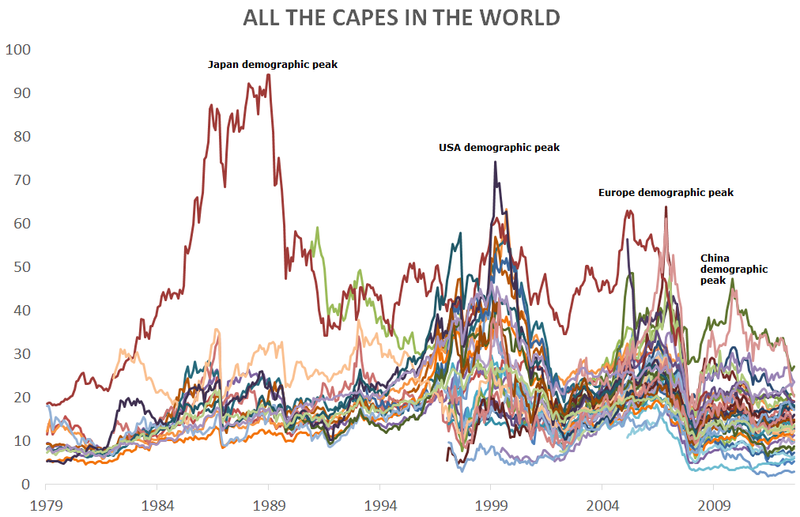 Would you be willing to post the current CAPE data in table format for comparative purposes? The thing is, these fundamentals never tell us where the market is going to go next. As P. Tudor Jones used to say: “Prices move first, and then the fundamentals follow”. With no edge to be found in fundamentals we can turn to things like cycles or technical indicators. But it’s not easy to find a good edge in them either. If we can find something that works 60% of the time it is great, but the overall performance will then depend on how we handle the 40% of times it doesn’t work. And that means cutting losses short. It’s OK to have losing trades. I have watched John hold on to gold all the way down, while continuing to add to losing positions. Why? I think it would be better to add to the winning positions, like this Dow short. Why take small profit on a winning trade, when it may have much further to go? Take a 5 year chart of the Dow Jones and last week’s drop is barely visible on it. I wouldn’t take the small profit. If we get some rebound rally, then that will be a good chance to add to winning position. But we may not get much of a rebound. In recent days I have seen strong selling in the final hour of trading. That’s not the moms and pops investors selling. The small investors do their buying and selling mostly in the first hour of trade. I have an edge using fundamentals and it works very well, so your statement is completely wrong IMHO. I also believe that I have a cycles edge too and I use it to time my fundamental based purchases. If a fundamental based purchase goes underwater there is no need to take a loss if the fundamentals have not changed and it makes perfect sense to add to a position in that case. I am not sure why you are criticising John’s trading, we don’t know all of the ins and outs but he seems to be doing very well (travelling the world, selling his house to boost his trading resources), and even if he wasn’t – why does it matter, he’s just discussing stuff not selling his views. Cycles are not certain or precise, all cycle watchers recognise this because we don’t have all the information needed in order to replicate the cycle with certainty (i.e. we haven’t cracked it), but we all know that there is an influence that can tilt the probabilities in our favour. You are right that money management is a key factor to survival in this game. Hi Kerry. In my part of the world it is OK to disagree with things you read on a blog and express why. If John wants only comments that agree with him or say thank you, then I am sure he will tell us. As far as I can see, in this post he is telling the market can go either way, so is unclear whether to close his Dow short or not. So my response is: why close a winning position if it has just started moving in the right direction one week ago, especially when you are investing based on demographics, which is about as long term as it gets? I don’t know about “your part of the world” but John’s lunar negative phase is ending and he has closed half and is pondering when to close the rest – seems straight forward to me. Anyway I’ll let John explain what John does. It’s just that I view your post as odd in that it isn’t to John, hence I view it as a criticism rather than dialogue. As if criticism is a problem. It is a normal part of dialogue, otherwise all you have is a kind of “patting each other on the back club”. If the solar or lunar cycle is not panning out, then we can just say so, can’t we? If somebody posts their trades in public, then it implies they invite comments on it. That means you can also say when you think something is a bad trade (or way of trade). What problem do you see with that? It’s not as if I am the first commenter on this blog who says that fundamentals are rather useless, or that it is a bad idea to throw good money after bad. Discussion is one thing but criticism can be perceived as negative. Anyway let’s go back to trading, have a good evening. Good idea. And let’s not forget, criticism can be perceived as positive too. Just like beauty, it’s in the eye of the beholder. In all things “research”, criticism is generally perceived as positive as long as it tries to shed light on a given question or problem. Danny, I consider you to have good knowledge and some of your constructive criticism is useful. But what doesn’t sit well with me is that all your comments are criticisms, particularly given my methods are successful. I don’t believe you have ever once posted something of agreement or praise, and for a while I wasn’t sure whether you were a trouble-maker. Since then you have said several times that you view your criticism as helpful and I have had to deduce that you see some value in my work because you keep coming, But if that is your nature, to only be critical, then that’s a long way from my own. For me, it is the heartfelt praise and complimentary posts that make writing the blog worthwhile. No I don’t want just a patting-on-the-back club, but a stream of criticism only, some of which is wide of the mark or invalid, is a little tedious, which is why I don’t often respond. Hi John. As recently as your August 8 post I agreed in my comment that the negative lunar periods will offer shorting opportunities in the next months. So much for me never posting something of agreement. 1) Criticism is more important than praise when it comes to improving products or ideas. A car company that is not critical of its own products will not improve them as quickly. So, that’s my attitude. 2) And now we are doing some straight talk, here is what doesn’t sit well over here. As recently as last winter, some commenters here pointed you to my website, but you answered them that your lunar positive period starts with full moon and ends at new moon. Then a few months ago you mailed me personally, telling me that you were doing research on the lunar cycles. A few days later you posted *your* research as “lunar edge”, without giving any credit. You think it is OK to “borrow” ideas elsewhere on the net and present them as your own research? Just imagine you were to email Kerry telling him that you are doing research into long term cycles. Then you put up a fixed page about a 17.55 year cycle, presenting ideas that do not differ materially from his 17.6 year cycle, but without even the most basic mention. Would it then surprise you if he becomes a bit more critical towards you? Actually, if you look at the fixed articles given in the side menu here, all of them fail to give credit where credit is due, even though it is clear that a lot of that material is borrowed research. That’s something you should look into imo. Not giving any credit for ideas you gather elsewhere is showing a lack of collegiality, and gives the site a copycat vibe. By giving credit, the readers can see what was brought in from elsewhere and what is your own contribution to the topic. Would make it look a lot better. You generally do mention sources in your blog posts, but you fail to do so in your research articles, where it is actually more important to mention sources. All my lunar research was my own. If you look on my lunar edge page then you can see there is some of the data evidence. Privately I have a much more detailed spreadsheet. Why did I shift from dead on the moon to 4 days? I came back from my trip with the idea to truly assess lunar. There has been quite a lot of lunar research all with different settings and lags around the moons of which yours is one. Dichve Janes chose 15 days either side. Stock-chartist uses from waxing to full. I did my own laborious testing of what worked best and the result was a 4 day lag beyond the full/new moon (you 3 day). I tested across different countries to find the most sensitive, I tested how long succesful and unsuccessful runs went, etc. It was all my own time-consuming research. As you are selling a product, I guess my offering of detailed research for free probably wasn’t so welcome. As for the bulk of my research down the side bar, if you read my PDF you will see I detail all the applicable sources. Plus the bulk of the models are my own creations, no source applicable. Ultimately it’s down to me: my site content, my approach and my research. If you’ve made it your business to try to ‘improve’ all that, then you’ve picked the wrong site. I suggest you move on. Have taken off another quarter Dow short today, so that’s half off in total. 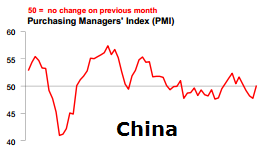 The latest flash PMIs for USA, China and Europe all positive and rising; the latest CB leading indicator for USA positive and up from last month. Plugging the latest geomag data in gives an uptrend in the lunar/geomag model into around 4 Sep before a drop lower. And the Puplava brothers showing evidence for rallying ahead (Ryan’s latest http://www.financialsense.com/contributors/ryan-puplava/buyers-vacation). I maintain the outlook for another rally in stocks to complete the topping process, and will then look to load in bigger on the short side. End of the lunar neg period this weekend, and Japan has broken out of that downward wedge. Long Japan again single unit. Half a million hits since launching solarcycles 18 months ago – many thanks to all the regulars! Biggest referrer of traffic: Handlerassociates. Don’t know who or what that is. Most comments: Jan Benestad – thanks Jan! Your input is much appreciated. Spam comments filtered off the site: 25,368. Fortunately that’s mainly automatic and I appreciate that no-one, so far, has been unpleasant or disrespectful enough to require any manual filtering or blocking. Keep it up! End of neg lunar period this weekend; is that based on full moon + 3 days? Or is the method more sophisticated? Currency issues in India and Brazil are going to make the BRIC’s more expensive? I see the India currency/gold issues and Brazil currency news as something that could impact status quo. Never commented, but visited here once a week for maybe a year now. A good read as always. Great site and a great source of information. I have been following you for over a year as well from Canada and greatly appreciate the approach and the fact you share your trading ideas and current positions. What is your view on gold at the present time and do you expect any pullback over the next few days/weeks as the current rally has been fairly strong. I am still pondering whether a position in the gold miners is wise at this stage or too late for now. What about the other commodities you do hold if you have any at this stage. Would it be better to wait for a pullback in the stock market before taking any new positions. Many thanks for all your good work and professionalism. There may be resistance at the $1400 level. But it clears above the level with no false break, it could mean rally ahead. I am still watching it at these levels myself, and see what happens in the next 2 weeks. Many thanks Martine. I hold pretty much the full range of commodities, biggest position in precious metals. I think the case looks more compelling now for late outperformance in commodities, with the commodities indices looking to have bottomed out in late June, the US dollar behaving weakly, and now China strength in leading indicators. Clearly a strong day yesterday for the whole complex with gold and silver breaking out, and oil looks to be consolidating in a range for another potential move higher. Regarding gold and miners, I am in the position of looking to take some off soon, as the buys I made into the falls have now largely all moved into profit; looking to buy in here is a trickier call. For gold there are several levels of resistance on the way up so hard to judge if and where it may pull back. Will just have to assess day by day. Keep up the good work. All the best to you. Your material have shine lights on issues which we overlooked in traditional publication. I do hope you continue with your progress, we all are learning as we go! I dont believe in the lunar cycle, but the data says it works. Cant fight that. I talked with John about this a year ago maybe. I researched in the Norwegian marked, and found a very high concentration of swing lows around the full moon, specially 1 day after. And many swing highs around the new moon. Calculating the average return through a lunar cycle, showd a low around full moon +1, and a high at new moon +1 day. Guess it all depends on market and period, but mostly people seem to get similar results. I however believe in the solar wind ~1month cycle, which often has a convincing real time correlation with markets. It differs slightly from the lunar cycle, so in periods they are in phase, and other periods they are out of phase. As for market now… my 1month cycle has peak around monday I think, and then weakens. My 6 month solar wind cycle leaves the bullish green phase around Sept 1. Since 2011 the markets have turned down when green phase is over (followed by yellow and red phase). Can happen that market turns down in green phase too, which means a very left translated wave/cycle. That is what my projections say about SPX – expect breaking down further to test the June lows, and general downtrend to November, and maybe into 2014 as well. How exactly are solar winds and markets correlated? Positive or negative? I mean : cycle high in solar wind is high in market or a low? Oh, and now we are here: do you have a suggestion were to find solar wind forecasts. I found sites that give the actual storms for today, but I haven’t found a forecast. I would gladly test your solar wind cycle. I use tidal information from the Reedy Point station. That gives roughly 7 days cycles. Strong gravitational force of sun and moon (i.e. high high tides and low low tides) tends to give downward pressure on equities. v.v. The timing of these turns is too close for coincidence. That’s why the solar winds interest me. Thanks in advance. I believe in lunar cycles but I don’t use it…I’ve read John since Amalgamator and I’ve enjoyed all those articles and comments. Unfortunately, this site content is far far away from my own approach, therefore it’s difficult for me to write something meaningful on the subject of stars, cycles and tweaking fundamental data. Me too, I may sound critical im my comments…and I do prefer a community where people discuss and disagree. I don’t think we should change our views because of one another. But if I had an online trading journal, I wouldn’t be able to accept too much criticism. Trading is most difficult job on the planet and although we all traders have an ego, we must stay positive and protect our trust and confidence. Coin toss entry + confidence&belief means more that most sophisticated entries coupled with botched trade management. I prefer a confident man with a spoon than an armed guy whose hands are shaking. A few months ago I visited the site of Nial Fuller. the guy is a real trader but also a salesman. His articles are ok and I agree with most of them. Wouldn’t it be logical for me to stick to his site? No! All he writes, I already know. If I disagree, my comment will be deleted. Our market views are dangerously similar, there is no need for useless disagreement. On the other hand, comments on his site look like ‘simply amazing Nial’ and the level of thought in them is simply below standard. I don’t think Jonh’s website purpose is to seek approval. I think it helps him with trading? I speak to me while on the platform, as if I was explaining to someone besides me what I see and what I do – this boost my concetration by 30%. “If a fundamental based purchase goes underwater there is no need to take a loss if the fundamentals have not changed” This is a big gamble. Because price movements do change fundamentals….very high prices of fossil fuels would turn the world up-side down, before changing the fundamental data and demographics. Appreciate your thoughts thanks. I have no problem with people disagreeing or being critical, but if someone is only posting negatively continually that’s something else, as I am sharing my stuff for free, and am confident in my trading and analysis backed up by my results. The site helps my trading in several ways – I have all my stuff organised in one place, I have input and assistance from your comments and emails, and I feel accountable to some degree, because I choose to share all my trades here I feel I am presenting them to a committee, which means no sloppy or poorly justified trades. Just lately I haven’t been posting as much due to pre-occupation with new life in Austria. Will think about direction once the bad weather season arrives. I haven’t commented for quite some time but I pop in every day to be honest. A new role in the Middle East has kept me very busy since the end of last year. The site is coming along great and this is one of my many tools for my longer term trading. Like you, I’m heavily invested in precious metals, particularly silver, and I’m probably a little top heavy if I’m to be honest. However, I’m also looking to trim back my allocations in the near future just to take something off the table. There is clearly still some gas left in the tank with regards to this gold rally, and I’m fully expecting a retrace before we go much higher. I’m expecting resistance up at around $1,420-25, possibly next week, and this is where I’ll sell some. With regards to silver, it certainly still seems to be in slingshot mode from the lows below £20 where I bought big and so I’ll be looking to sell some of my allocation at $26-27 where I would expect the retrace to commence. I’m long the Dow from Friday’s lows and I’ve also shorted GBP/USD, the latter being a longer term trade. Let’s see what the week and month ahead brings. Hope you’re well. Thanks Jonathan, good to hear from you again. Much like d906 in the post above, I mostly operate in the markets using different methods than yours John. However I read your site weekly because your research ALWAYS makes me think. I very much enjoy what your blog represents, a real time journal from a humble, considerate professional trader. All for free to boot. Please keep up the great work. My wish is that others can disagree but keep a kind and balanced approach. Conduct yourself as if you were invited into the man’s home for dinner. On a side note, I thought your entries on global demographics will prove to be great roadmaps going forward. 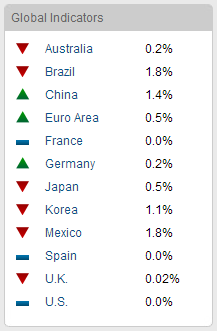 I’m particularly interested in Brazil, as technically it appears to be bottoming. Could it be a beautiful entry for the buy and hold? We shall see. Place your bets, gentlemen. “I prefer a confident man with a spoon than an armed man guy whose hands are shaking.” Amen. That’s much appreciated Rick – thanks! Please do not agree guys. Discuss and question. There is a million ways to make money in the markets. Personally, I do not believe in funnymentals except for true value investing in certain stocks as I have the quantative data to prove it. The lunar cycle is ok, if you know how to use it. Not much different than an RSI etc though. Just an indicator. When it comes to GDP data etc I think it is usesless unless you can show me statistically significant studies of it. The more parameters that are thrown in, the more your brain has problems in taking a decision. Keep it simple and stupid. Trade the money and forget about the rest unless you can show in the same quantitive manner that it improves your trading system based on long term results and not your feeling. Feelings are bad in trading. Trading should be effortless. I.e. is there a signal, if yes then take the trade, put your stop loss and profit targets. Trail stops and take profits or get stopped out. The prediction part leads to financial ruin long term and boom bust trading in my opinion. Only thing that really matters is your bet size i.e. money management in my opinion – how you scale in and out. Everything things else is random over the long term =). Just use a HORIZONTAL LINE. The exact phasing of the moon cycle will change over time. I.e. 2 days after 4 days after or something else or reverse or whatever. I think starting in buying the moon and then average down a bit during the cycle is the way to go on a 15 min chart. And then average out during the bad phase. You can analyze and fight over the moon cycle or the solar wind or whatever but nobody will ever find the exact key. Probably has something to do with pi and the pyramids =). The key is in your brain. Just average in and out. Forget about the rest. Spend the time with your woman lady instead. Could be a catalyst but full on rally on oil price requires a total chaos in middle east, if the situation is spilled over the nearby countries – Iran, Israel, Iraq. At current price level, risk premium may be priced in already. On Brazil, can bovespa bottom with the currency still in a precarious position? Obviously smart guys say that with money going into Bovesap, BRL should appreciate. Locals are out of the currency as fundamentals are very poor. BRL and INR both moving in line with each other this year. or for that matter, add TRY. India will face a tougher time than Brazil. There’s a larger middle class population growing in BRZ than IND, the level of inequality is very apparent in India, where majority still lives in poverty. Both are in currency crisis mode but India will take the brunt of it harder, since they are require to import commodity to feed the masses. If basic needs can’t be met, there will be tension ripping through the society. I will be buying when the Nifty sells off even more. Looks like a once in a lifetime opportunity is setting up, similar to when Warren Buffet invested in South Korea small caps in 2009 at ridiculous low valuations. Syyria and commodities? Looks like you got your answer. It’s positive especially for oil, gold, and silver. Beans and grains strong due to heat as well. Negative for the stock market. Just heard an ol’saying I had never heard before. The market falls on rumors of war, and rallies on drums of war. That happened in with the Iraq wars. Kent: here here. If there is actually a war then statistically bull has better odds from the studies I have seen. I don’t see enough for a separate post right now, so here are my current thoughts. For four weeks we have seen commodities outperformance versus stocks, and the commodities indices look to have bottomed out since late June. We have geopolitics, climate and weak dollar all playing their part. 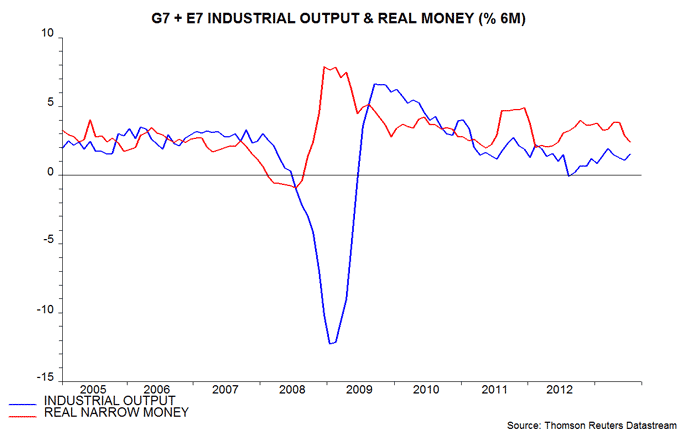 Plus I would suggest money flow exhaustion in stocks is now looking for value in commodities. So, the picture looks more compelling for commodities to make (or be making) their late-cyclical surge. Meanwhile stocks increasingly look like they are making a multi-month topping process. But, gold and silver are short term overbought and the USD looks ripe for a bounce, so I suspect we can see a pause here, and stocks could muster a bounce into next week’s lunar positive peak. I don’t see enough reasons to take partial profits in commodity positions so am staying put with the full set, expecting further gains post any digestion, whilst wary of the mid-Sept FOMC and possible tapering. I’d like to see WTI consolidate its breakout above 108.5 now, and agri attract more momentum, to further the case for commodities. The Syria issue is clearly tricky because further escalation towards intervention is likely to push oil prices yet further which in turn will kill the fragile Western economies. Might the US intervene AND postpone tapering in order to support the economy? That would be the dream scenario for precious metals. Of course, a decision to NOT risk intervention, and then to initiate tapering, would like puncture the recent strength in oil and gold. However, the bigger question is whether commodities are set to rally anyway (solar cycles, Pring topping order) and fundamentals will be made fit regardless. That will become clear with time. War = more QE. Bearishness had been going on for a year now on this site =). I think we are consolidating in the indices and then we go higher. Lots of interesting things to talk about. Crashes frequently start near new moons as did this one, and decline to the next new moon. Markets then rally @ two weeks from the low(Sep 5) to the next full moon, Sep 19. Military attacks frequently come on new moons. Finally bottoming on the lunar eclipse, Oct 18. Crashes hardly ever work out but —- The last two Iraqi wars were major bottoms for the stk mkt. Gold and oil had already topped and kept going down. $ once just kept going down, the other started a big rally. How about those beans. We need a post John. Your call and Gann’s call for one final rally looking better. Don’t forget the commodity blow off top in 2015 Kent, as per the 17.6 year cycle. I am positioned accordingly. This is a secular bear market Robert, fear rules (until 2017). Kerry: Really. My BAC long term warrants from 2 bucks a pop are still rising. We are in a bull market climbing that wall of worry each day. =). I have seen all that work on the cycles and it all looks very convincing but then also not. I go for Benjamin Graham and buy value and fear and sell euphoria. Short term just trade. Can’t see were that bear market is? Cycles are good but also study John Law = Ben Bernanke. Long cycle trading is very dangerous, especially when it is precise .5. Would not bet my money on it. Also went long National Bank of Greece during the summer after the capital injection. Long and strong. Have gone long Turkey equities this morning. It is one of several emerging countries that have been suffering harsh currency and stock market drops, so it has come down in value fairly quickly, and it stands out as the cheapest, at 8.6 p/e. As per my demographic work, p/es largely reflect demographics and Turkey’s are particularly good, so this is an anomaly and I am playing for the reversion, whenever that comes. I’ve just been looking at Armstrong’s 8.6 year cycle and some use it from important highs and lows. The date of the lowest point in the 1987 crash was 20.10.87 and if you add 8.6×3 you get 25.8 years ie.2013. 365 x 0.2 gives 73 days BUT when you add 7 for the 7 leap years you get 80 days prior to 20.10.13 as possibly an important top/bottom which would be 1st August and the top this year was 2nd August. Many people are looking for a top this Autumn or early 2014 but perhaps it is in?! as expected the 118MA in solar flux (yellow) is turning down, as this ~9month cycle weakens into Xmas. Are we making higher highs? Are we making lower lows? The crash will come once. The rest of the time we go up. Touting the crash each month is not an edge. Holding out of the money puts each month is and edge so I do not care about the predictions. Most of the time the markets will go up. Once in a while it will go down some and I buy more and cash in the OTM options so RELAX. But there is no edge for any significant upside in SPX for the next 6-12 months,and a very high risk of some serious downside. What would be more interesting and valuable is if you guys do a study on every crash that we have had and the opportunity it gives to sell out at break even or near break-even after the initial fall i.e. how price creeps back to overhead resistance before it really crashes. That is the point to go short or be scared. Cudos to the one that does that study and posts it here. =). there are some common patterns in market crashes, while 1987 was somewhat different. But I dont expect a crash – they are mostly “bullish”, meaning that we get a quick wash out, and then a new uptrend. I expect a bearmarket, and the start slowly. Everyone are bullish, and keep buying the corrections, and when a downtrend of lower highs and lows is formed, one thinks it is just a bigger correction in an uptrend, or a soft landing. I do not have a clue. If we get lower lows with some new scary information i.e. we find out something like that the paradigm of the housing bubble to collapse then yes I will look at shorting. Until then I think it is better to be long. All the misery is known by everyone. US Debt, Euro debt, War etc etc. Nothing is new yet. Every money manager on this planet has been indoctrinated with the crash of 2008 and for us that lived through it we still remember and think about it. For that reason, I do not believe we will see it anytime soon =). I think the tail to protect is the RIGHT tail i.e. that we go up. =). More money is lost trying to predict the top than anything else. But then again I do not know and do not want to know. I like the stuff you do here with the planets and cycles but unsure if it works that well besides the approx timing of the lunar cycle/solar wind for short term trading at the same time a 7 period RSI also works well =). Hi Robert, for better or for worse I am a bottom and top picker. Bottoms are usually capitulation events, with signs like capitulative breadth and high volume hammer candle, whereas a top is usually a multi-month process, with clues in breadth divergence, technical shaping and price range, and observation of some 90% down days. In short, I believe we can work them out and that it’s not a fool’s game. 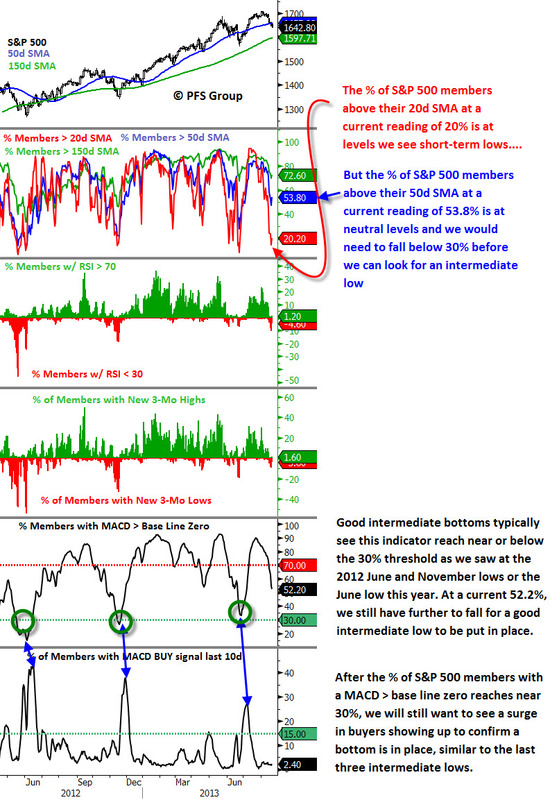 So far we see good evidence of such topping clues in the price action since May. Now it needs to complete. If price instead breaks out upward on strong breadth and leading indicators stay strong then the topping process is invalidated. Until I did my demographic research I believed the safest trade was averaging down on the long side playing a stock index (this post: https://solarcycles.net/2013/03/23/highest-probability-trading/). But the collective demographic downtrends now in place in most of the major economies is unprecedented and I believe is a game-changer now and going forward, at least for the next 5-10 years. It makes things particularly difficult I believe as I think this demographic downforce will (and already has) halt the historic norm of stocks (and real estate) gradually reliably rising. I’m not sure there will be a buy and hold asset this decade nor somewhere clearly safe to average down or up into. Traders in the 80s and 90s really had it good. How did it look like in the South Sea bubble with John Law? How was demographics in those days? Would be interesting just to understand. Think the long term projections are a bit dangerous but that is just me. Ben Graham stocks work time after time after time. Just smoking those cigar buts double bottoms. The pump keeps on coming. =). A good case study is the stock Radian to what happens to price when everyone is bearish and wanting to short. Went from 2 up to 13 or something. Yes subprime credit or something. Hi John, what do you think of US markets today as it is near the lows on SPX from Aug28. Are you planning on buying this dip and do you still see a rally into September? Rally to end into late September? Thanks. Hi, yes I still expect a rally ahead, to complete the topping process. I have played that by halving shorts on the Dow and I will ramp up short exposure again if we get the rally along with more evidence of the cyclical top. Another factor to consider in the context of top/bottom picking is valuation which is probably the ultimate arbiter of a good or bad investment. US PEs have expanded greatly and profit margins are at historic levels and well above long-term averages. John Hussman and Jeremy Grantham do great work analyzing valuations. In warning about current valuations, they have become broken records to some extent and have lost credibility as a consequence, so much so that they are almost apologetic in expressing their beliefs. The lack of respect they currently are getting may speak volumes about where sentiment really stands in the US. It also suggest that while there may be buyers on the way down who have been hoping for a dip, right now, the gap between where the major up-trend snaps and where the value buyers step in is pretty large. The markets have stayed irrational for a while. It looks like it is time to find out where the true equilibrium is. Elaborate ‘not a coincidence’ wxguru? The solar cycles influence on steering and shearing upper level winds. The popular forecasters do not readily incorporate the research found to have an influence. September is a bad month statistically but we have already fallen a bit. Trade your system unconditionally. Do not switch. Good stuff but be careful of your short bias ;). Hi Jan, great calls so far on SPX. I was wondering if we hit near 1550, don’t you see us going back to 1700s and possibly 1800 @ the end of yr? Isn’t the fall season the best time to go long? There is no volume in the market place and if we breakdown to 1470, absolutely nobody will be playing the markets no?